This site is designed to help you get started in learning Zulu. It offers helpful hints, tricks, and tools for you to jump into Zulu. Zulu is one of the eleven official languages of South Africa. It is the most widely spoken home language in South Africa, spoken as a first language by approximately 25% of the population, or around 11 million people (using 2001 census data). Zulu is a Bantu language, meaning that it is related to other Bantu languages like Swahili and Chichewa, the language of Malawi. Zulu is within the "Nguni" category of Bantu languages, and it is closely related to several other language in South Africa of the same family, notably Xhosa. Interestingly, unlike most other Bantu languages, Zulu has a number of click consonants, 12 to be exact (!). This gives it a very distinctive (and attractive!) sound. The following map shows where Zulu is mainly spoken. 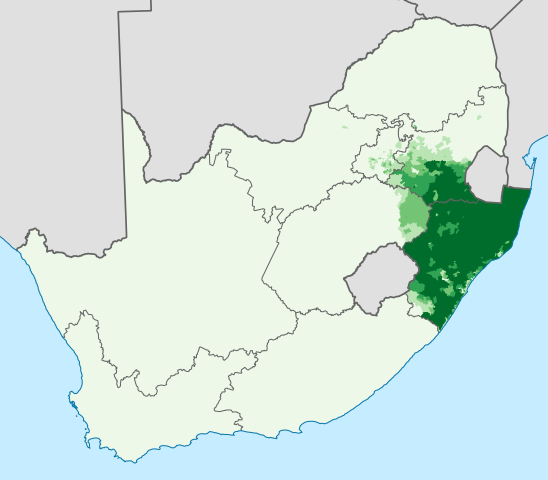 It should be noted that because Zulu is such a major language, it is spoken in all the urban centers, but the map indicates where it is most common as a first or home language. As we can see from the map, Zulu is mainly spoken in the Eastern part of the country, not surprisingly in the province called KwaZulu-Natal. Zulu is also widely spoken in Johannesburg which is close to KwaZulu-Natal. Enlisting the help of a Zulu conversation partner can significantly improve your language learning. It will help to motivate you to continue learning and give you a sort of test every time you meet with them, so that you can gauge your progress and figure out where you need to improve. Here are a few useful ways of finding a language partner. Check to see if a local college offers Zulu. If so, it is likely that they have at least one native Zulu speaker around to teach the class. Try to get in touch with this person and see if they will meet with you. Many people will likely do this for free because language teachers usually enjoy sharing their language, but you can always offer a small monetary gift or perhaps coffee or dinner every so often. Perhaps your city or a nearby church offers cross-cultural dialogues or other events. Attend these and maybe you will find someone who speaks Zulu. If not, at least you will meet some other interesting people! This may sound a bit strange, but it oftentimes is a good idea! Some churches in the area may be known for having a lot of international members. Visit these churches and see if you can find someone from South Africa. It may be a bit awkward, but people at churches are generally friendly, so there's no harm trying! Visit an English language school or your area (or e-mail them if you prefer) and ask if they have any students from South Africa that may be interested in meeting with you to help you with your Zulu in exchange for some English practice. This may not be the best method for finding a Zulu language partner because most South Africans already speak English, but it is worth a shot!